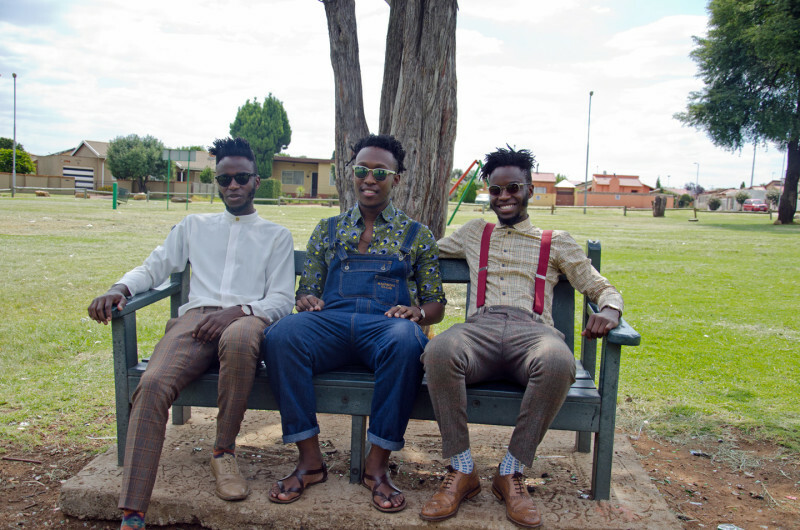 On a sweltering summer day, I meet the trio behind the brand I See A Different You (ISADY), a creative collaboration between twin brothers Innocent and Justice Mukheli (29) and their childhood friend Vuyo Mpantsha (25) in Pimville, Soweto, the place where they spent their youth. We sit in a park while children play on swings – their shouts and boisterous laughter could transport you to any playground in the world. While they live in the lush suburbs of Johannesburg today (“I always dreamt of living in Sandton, for some reason,” says Innocent), they return to Soweto each weekend to catch up with their families and old friends, sometimes cycling 45 kilometers from Sandton to get there. I soon learn that bicycling is more than a casual pastime; it’s a way to explore the city for new locations, authentic backdrops and peace of mind. The trio are often referred to as ‘creatives’, and I wanted to get to get a better understanding of what this entails. “We had a varied creative start, by making t-shirts, sketching, designing and eventually taking photographs when we received a camera for our birthday in 2010,” says Innocent, dressed in fitted tweed pants that sit neatly above his ankles, and a tailored check shirt with red suspenders. “Creativity is an outlet, it’s a way to express yourself without words, for us,” he continues. 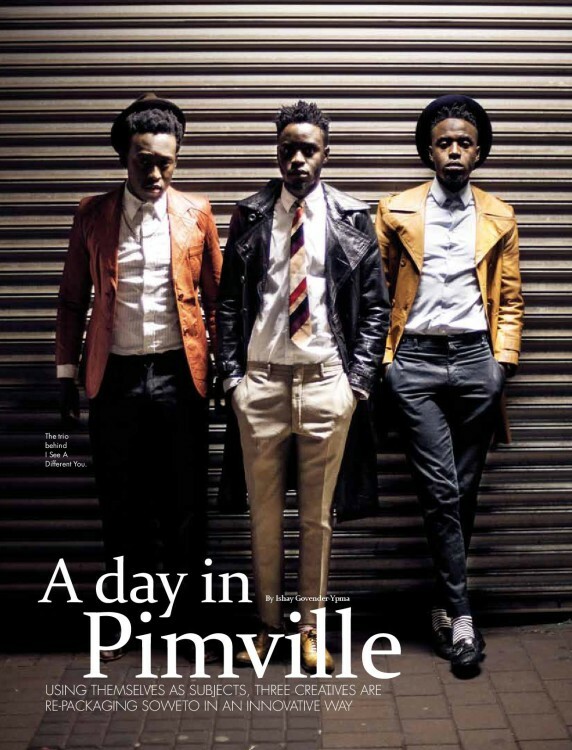 The three are respected art directors for advertising agencies Ogilvy and Draftfcb by day, having catapulted into the public sphere for the stylised portraits they take of themselves in Soweto and surrounds for ISADY, a passion project that has enabled them to fulfill several dreams. 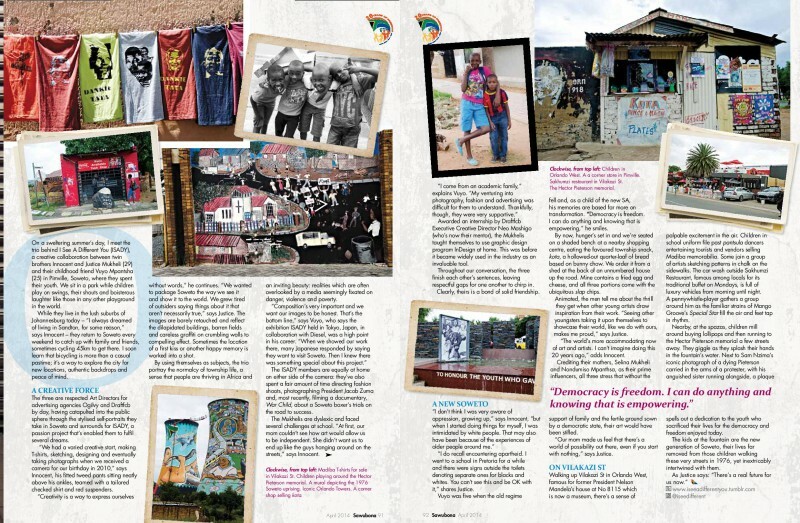 “We wanted to package our Soweto and show it to the world, the way we see it. We grew tired of seeing outsiders saying things that weren’t necessarily true,” says Justice. The images are barely retouched and reflect the dilapidated buildings, barren fields, and careless graffiti on crumbling walls with compelling effect. Sometimes the location of a first kiss or other happy memory is worked into a shot. By focusing on themselves as subjects, ISADY is able to portray a normalcy to township life, a sense that people are thriving in Africa, and a beauty that is inviting. In other words, all the things that life in Soweto encapsulates, whereas the media seems to be fixated on danger, violence and poverty. 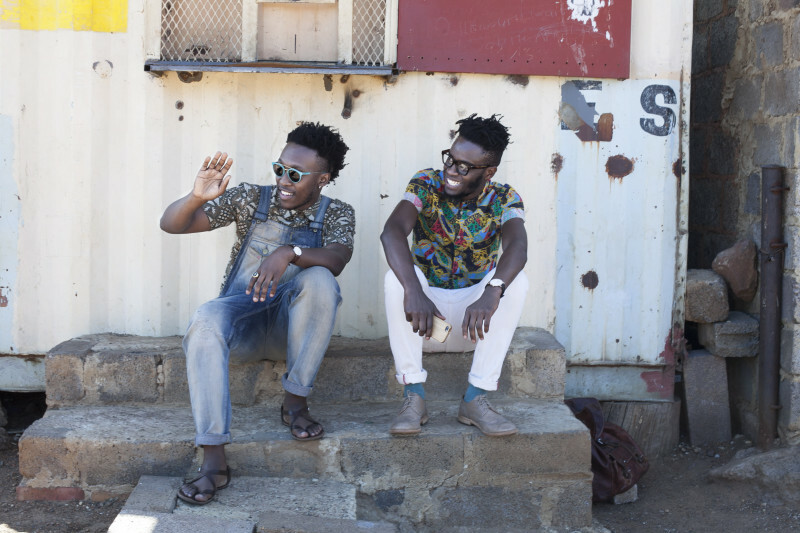 While ISADY are no strangers to being in front of the camera, for these photographs, as well as their work as fashion models, they have spent a fair amount of time behind the camera directing fashion shoots, photographing President Jacob Zuma and most recently, filming a documentary, War Child, about a Soweto boxer’s trials on the road to success. The Mukhelis are dyslexic and faced several challenges in school. “Our mum wanted the best for us and at first she couldn’t see how art would allow us to be independent. She didn’t want us to end up like the guys hanging around on the streets,” says Innocent. Awarded an internship by Draftfcb executive creative director, and their now-mentor Neo Mashigo, the Mukhelis had taught themselves how to use in-design, a graphic design programme at home. This was before it was used by the industry, thus making themselves invaluable from the start. All through the conversation, the three finish each other’s sentences, leaving respectful gaps for one another to chirp in and it’s evident that theirs is a bond of solid friendship. “I did see reminders of life before democracy. I went to a school in Pretoria for a while and there were signs outside the toilets for black and white. You can’t see this and be okay with it,” shares Justice. Vuyo was five when the old regime fell and his memories are based on transformation, a child of the new South Africa. “Democracy is freedom. I can do anything, and knowing this is empowering,” Vuyo smiles. By now, hunger has set in and we are seated under a shaded bench at a nearby shopping centre, eating the favoured township snack, the kota, a hollowed out quarter loaf based on a bunny chow. We order the kota from a shed at the back of an unnumbered house up the road. Mine has a fried egg and cheese, and all come with the ubiquitous slap chips, a South African favourite. Animated, they tell me about the thrill they get when other young artists draw inspiration from their work. “Seeing other youngsters taking it upon themselves to showcase their world, like we do with ours, makes me proud,” says Justice. “The world is more accommodating now to art and artists. I can’t imagine doing what we do, living this life 20 years ago,” adds Innocent. Crediting their mothers Selina Mukheli and Nondumiso Mpanthsa, amongst their top influencers and inspiration, all three stress that without the support of family and the fertile ground sowed by a democratic state, their art would have been stifled. “Our mum made us feel that there is a world of possibility out there, even if you start with nothing,” says Justice. Walking up Vilikazi Street in Orlando West, famous for the house at number 8115, Nelson Mandela’s residence, currently a museum, there is a sense of excitement palpable in the air. Children in uniform walk in files after school, past the panstula dancers entertaining tourists and the vendors selling Madiba memorabilia. Some join a group of artists sketching patterns in chalk on the sidewalks. The car wash outside Sakhumzi Restaurant, famous with locals for its traditional buffet on Mondays, is full from morning to night, polishing luxury vehicles. A pennywhistle player gathers a group around him as the familiar strains of Mango Groove’s Special Star fill the air, and feet tap in rhythm. Nearby, at the spazas, children mill around to buy lollipops and then run across to the Hector Pieterson memorial a few streets away. They giggle as they splash their hands in the fountain’s water. Next to Sam Nzima’s iconic photograph of a dying Hector Pieterson carried in the arms of a school boy, anguish plastered on the face of his sister running alongside, a plaque spells out a dedication to the youth who gave up their lives for the democracy and freedom enjoyed today. The children at the fountain are the new generation of Soweto, their lives far removed from those children walking these very streets in 1976, yet inextricably intertwined.